…is one that finally fits after days and days of muslins and tweaks! 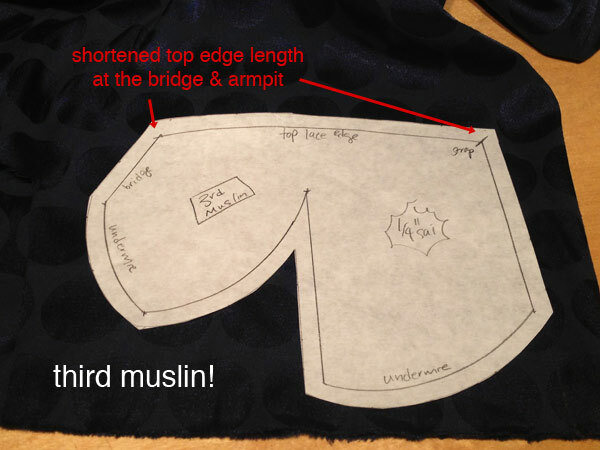 You see, this is the third muslin of my latest attempt to sew a Bra That Actually Fits and I think I’m finally happy with this one. 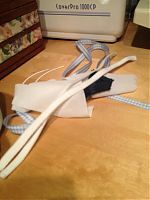 I started off by tracing a well-fitting RTW bra and I sewed up a muslin of it according to the fabulous instructions in Demystifying Bra Fitting and Construction. 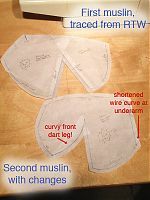 From that, I could see that the bottom of the bra cup was too long for my underwires, and, as I suspected, the straight legged dart was too pointy and I needed some room in front of it, so I made the front leg curved. The cup shape of the second muslin seemed good (though it’s hard to be subjective in the mirror and selfies), but I had a bit of excess fabric along the top edge of the cup that needed pinching out. I didn’t want to create a dart at the top edge as I eventually want to make this bra from lace, so Norma suggested I take it out from the sides (bridge & underarm), making sure those lengths didn’t change as I did so. By way of a PSA, posts might be thin here for the next week or so – you’ll probably remember that I’ll be running the Copenhagen marathon this weekend, but I’m also now immediately travelling over several oceans and hemispheres for work next week as well, and will likely be just as exhausted from the travelling as from running 26.2 miles! I’m hoping to get a few magazine posts scheduled to go live while I’m away to keep you all entertained, but if you don’t hear from my about how the marathon went, don’t assume the worst! If you’d like to cheer me on, however, you can follow me on Twitter or Dailymile and reply to the “Runmeter will speak your replies to me” message on Sunday. My app will then speak your comments into my ear as I run, which is a) really freaking cool and b) incredibly motivating! The race starts at 9:30 CPH time (8:30 BST / 3:30am EDT) but frankly, I’ll really need the help about ~3 hours in, so around 12:30 CPH time / 11:20 BST / 6:30am EDT). Separator image Posted in In Progress and tagged with drafting, lingerie, muslin.